Most air-conditioning units are installed at ground level, but sometimes they're mounted higher up in the house. 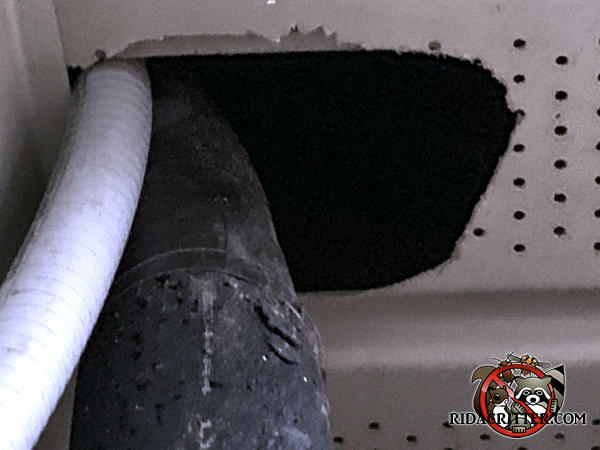 In this house, the air-conditioning wires and refrigerant line were passed through the soffit panel through a hole that left enough space for a squirrel to start chewing its way into the soffit. This is unusual mainly because it's unusual for air-conditioning lines to pass though a soffit. Squirrels will take advantage of any gap to use as a starting point to gnaw their way into a house.